Names are super important at our house. My toddler doesn't like to be called any nicknames. He always says, "No! I'm just Ryan" if I call him anything besides his name. My preschooler also loves her name and how it is spelled and is constantly looking for other words that have similar letters as her name. They LOVE name activities and crafts! We've also been having a blast doing other Spring activities lately. We even had a Spring party! Check out the party details and our party American Express gift card giveaway HERE. We spend a lot of time doing name activities and crafts at our house, especially name sticker activities and hunts. I even have an entire Pinterest board devoted to name activities. 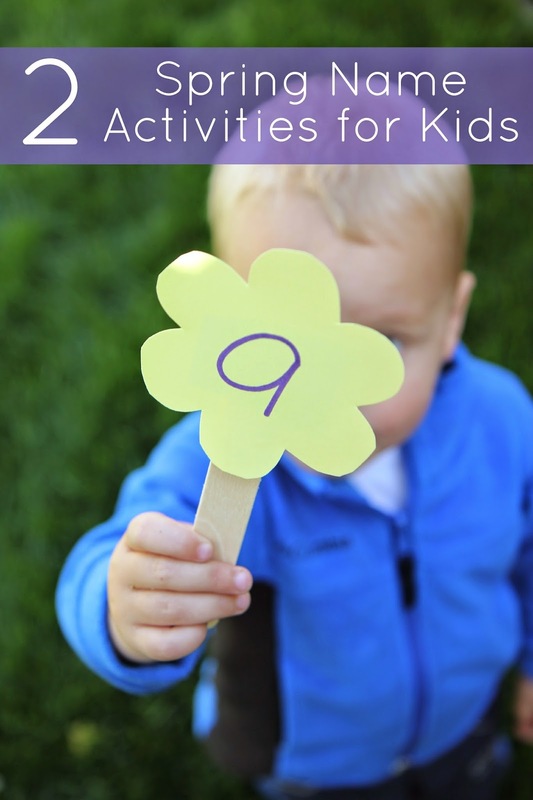 Today I am excited to share two super simple Spring themed name activities that we like that also get kids moving! Our first activity is a flower name hunt. The flower name hunt is really similar to our Name Egg Hunt, except it uses flowers. I am not one to reinvent the wheel if it is already working, so we love to make different variations of this same name hunting activity for a variety of holidays and seasons. To prep ahead you cut out several flowers from cardstock and decorate them. Cut enough flowers that you can spell your child's name (one per flower). You can also laminate them if you want. Then you stick the flowers to craft sticks and hide them around your yard or inside your house. You also want to write the letters of your child's name on the front of paper cups filled with soil. My toddler loves to help scoop soil into cups so he had fun helping with this! Have your child go hunt for the flowers around your yard (or house). As your child finds the flowers have him match each flower to the correct flower "pot" with the correct letter name on it and stick it in the pot. Once all flowers are matched, pull them out and hide them again! This is just a fun way to work on getting to know the letters in your child's name and have fun building their name! You could also solely work on name recognition by hiding several flowers with full names on them (including your child's name). Encourage your child to only collect the flowers that have his name on them and plant them in the pots. For this activity you get to use water! My toddler has been obsessed with watering plants lately, so I thought we could do a fun name recognition activity that also let my son water some "plants"! 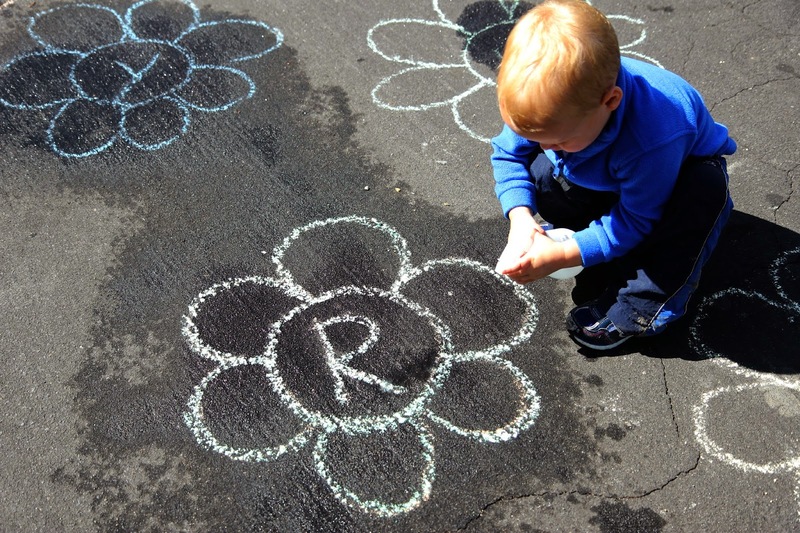 Draw some chalk flowers on the driveaway or sidewalk. Write an alphabet letter on each flower. Make sure to include all of the letters found in your child's name. Lastly, write each letter of your child's name on a notecard. Give your child a watering can or spray bottle with some water in it. Show your child a notecard with the first letter in their name on it. Encourage them to go and water that letter using their watering can or spray bottle. Show the child the second letter in their name and have them go water that later. Next show them the third letter in their name and have them water it... and on and on until they have finished sprayring each letter. If the kids love it, feel free to write the flowers//letters again and play again! Once your child has learned the letters in their name you could draw the chalk flowers to look like a garden and put the letters in a row. Have your child spray each letter in a row as you spell their name. One of the foundation skills for learning about your child's name is learning the letters in their name. My kids are especially excited about the first letter in their name. Both of these activities are great for introducing your child to their name and the letters in their name and then gradually teaching them to build their name. 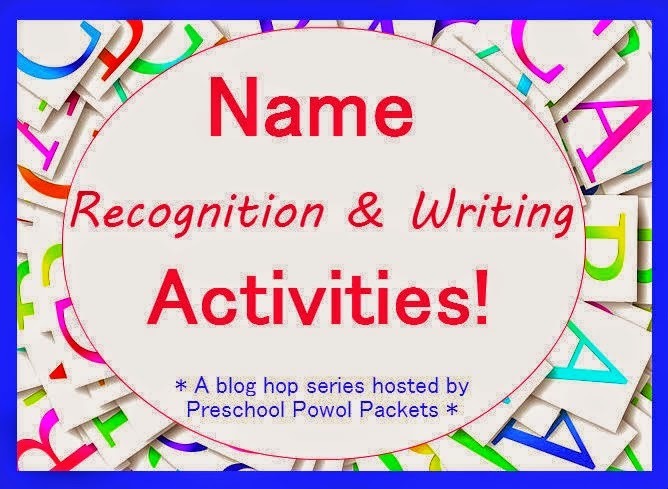 We are also excited to join in with Preschool Powol Packets Name Recognition and Writing Series. You can find loads more name activities over on the series landing page HERE.